Happy tossed yellow Pikachus on red background. Each Pikachu is about 2 inches tall with a fabric repeat every 12 inches. New, straight from the bolt, 100% high quality quilter's cotton. Continuous yardage. 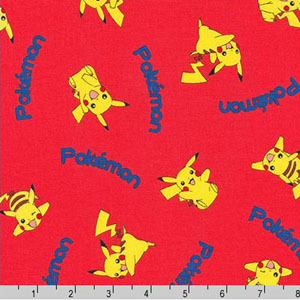 From the Pokémon Fabric Collection from Robert Kaufman Fabrics. Price: $2.25 per fat quarter 21" by 18"